36 Inch Big Egg Foam Prop - Dino Rentos Studios, INC.
36 inch tall foam egg. Made from 1 pound EPS foam. Great for Easter retail displays. 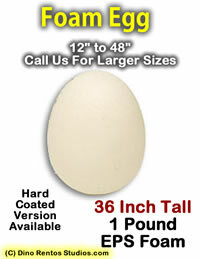 Get your egg hardcoated for durability and longevity. Note: Items over 30 IN Tall may require additional shipping cost.